This black Toyota Highlander is controlled by Zoox software. It can now cruise through some of San Francisco's toughest hairpin turns. San Francisco’s Lombard Street is famous for its eight hairpin turns. Tourists in rental cars slowly snake their way past the street’s beautiful homes, then review the experience on travel websites. Zoox Inc., the self-driving startup, uses the crooked road to measure the incremental improvement of its autonomous software. He’s sitting in the back passenger seat of a black Toyota Highlander controlled by Zoox software as the car cruises through what Levinson calls the Challenge Course. Two safety drivers sit up front. Operating solely on its artificial intelligence, the vehicle creeps through each tight bend. When a group of pedestrians decides to stand six abreast for selfies, the car comes to a smooth stop. After a moment, the SUV navigates to the right of the tourists, then slips left to avoid a garbage can blown into the road. Next, facing a steep uphill climb on Grant Street, the Zoox software flexes its inhuman abilities. The on-street parked cars form a tight gauntlet that even the most careless human driver would crawl past for fear of a sideswipe. But the self-driving software uses sensors to measure the open space, and the Zoox SUV buzzes straight up the hill at quick clip. “From the latest version of the code, we deploy an update every two weeks,” Levinson says. While the technology is advancing, Levinson acknowledges that building a business behind it has proven far more difficult. Zoox plans to eventually operate a fleet of robotaxis, a model being pursued aggressively by much larger and better-funded competitors including units of General Motors and Google’s parent company Alphabet Inc. Levinson’s co-founder, Tim Kentley-Klay, was pushed out as CEO by the board in August. A new CEO, Intel Corp. veteran Aicha Evans, took over the role in January. Now Evans and Levinson plan to raise capital as Zoox races to launch a ride-hailing service to serve paying passengers by the end of 2020. This time, Levinson says, Zoox wants to raise more than the $465 million it got last year in a round led by Grok Ventures. Levinson is looking for investment from a combination of financial and strategic partners, and would even consider a major automaker. If a bigger partner can help the startup in nuts-and-bolts areas like manufacturing or servicing cars, it could be a good fit. Unlike Alphabet’s Waymo, another Silicon Valley-born self-driving startup, Zoox remains focused on manufacturing its own vehicles rather than retrofitting cars made elsewhere. The Toyota Highlander used in testing is only that -- a testing vehicle meant to be supplanted by cars Zoox will create itself. Waymo buys cars from Fiat Chrysler Automobiles and Jaguar Land Rover Automotive. GM Cruise is owned by one of the world’s largest automakers. Zoox doesn’t want to upgrade anyone else’s existing model. That’s a big reason Evans was recruited. She had been chief strategy officer at Intel, and before that was a vice president of communication and devices at Platform Engineering Group. Experience managing a hardware-making business can help the company scale up globally, said Mark Rosekind, Zoox’s chief safety innovation officer and a former administrator of the National Highway Traffic and Safety Administration. Zoox needs more cash -- probably a lot more. The company has raised just $800 million so far. GM Cruise has raised $5 billion from SoftBank and Honda Motor Co. and has been allocated a $1 billion annual budget by its Detroit-based parent. Waymo has access to Alphabet’s huge war chest. Zoox also trails its two biggest rivals by total testing miles and in how far its cars travel in California road testing before human safety drivers have to steal the wheel from the robot. Levinson is adamant that Zoox must have a purpose-built autonomous car. The company’s current prototype vehicles have tubular steel frames packed with cables, wiring and printed circuit boards, all sitting on four wheels. The latest version, called the VH5, also has seats that face each other and no steering wheel or pedals. That’s a blueprint Zoox wants to stick with. Zoox is betting, in part, that it won’t take that many cars to build out a driverless ride-hailing fleet. Rosekind estimates that about 1,000 cars can handle about half the ride-hailing traffic in a city like San Francisco. Back on the streets, the Zoox test SUV stops at one of San Francisco’s few six-point intersections. The self-driving car waits patiently for pedestrians to pass, then yields the right of way to a white Nissan that decided not to wait its turn. The car then angles to the left and continues on its way. Mastering that intersection was another milestone in the development of the company’s artificial intelligence -- a year ago, Levinson says, the software was stumped. Now it seems quaint compared with what he says more advanced Zoox prototypes can do. There is, Levinson says, a Zoox test vehicle that can drive without human intervention into areas that haven’t been previously mapped. 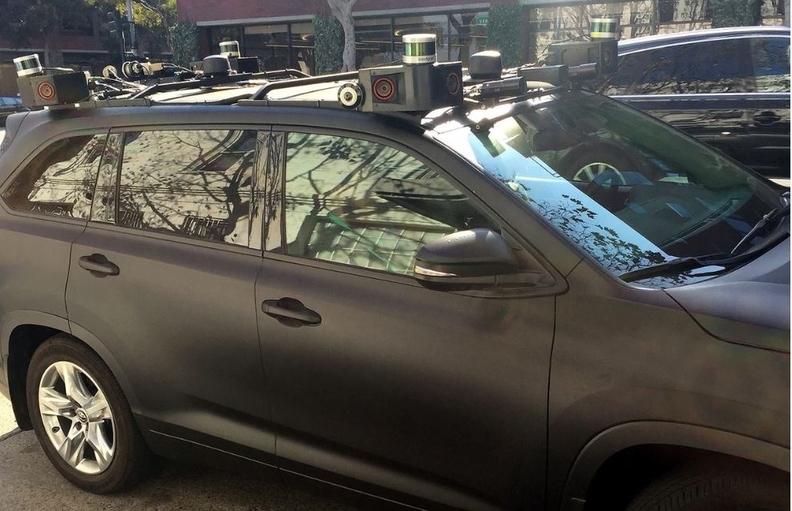 The autonomous vehicles being operated on public streets in California and elsewhere are limited to carefully mapped areas. The ability to navigate the unknown without human help is a threshold that self-driving engineers call Level 5, the final step on a five-point development scale. Zoox won’t show proof of this capability -- not yet.